The Obama administration dealt a setback to Royal Dutch Shell’s Arctic oil exploration plans on Tuesday, saying established walrus and polar bear protections prevent the company from drilling with two rigs simultaneously at close range, as it had planned. The U.S. Fish and Wildlife Service issued Shell a permit which emphasized that under 2013 federal wildlife protections, companies must maintain a 15-mile (24-km) buffer between two rigs drilling simultaneously. The rule is meant to protect populations of animals sensitive to sounds and activities of drilling. Walruses have been known to plunge off rocks into the sea during drilling, putting some at risk. The animals are already at risk from reduced habitat due to global warming. Drilling with only one rig at a time would slow Shell’s drilling progress, but by how much was unclear. Shell, which has invested about $7 billion in its Arctic exploration over several years, is evaluating the permit and “will continue to pursue” its drilling plan, spokesman Curtis Smith said. The company hopes to begin producing oil there in 10 or 15 years. “Our goal is to safely accomplish as much work as we can before the end of open water season.” The return of ice in late September ends the drilling season. In Shell’s 2015 Arctic drilling plan, no two of its wells are more than 15 miles apart. Two of the wells it had been planning to drill in the Chukchi Sea off Alaska are about nine miles (14 km) apart. The move by the federal government came the same day that Shell began to send the Noble Discoverer, the second of two drilling rigs, up to Alaska from the Seattle area, for drilling starting in late July. 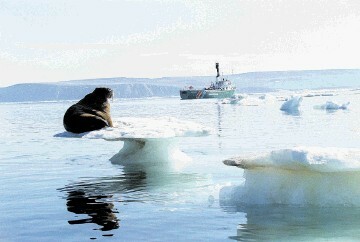 Shell was hoping to return to Arctic drilling for the first time since its mishap-plagued 2012 season. Last week, green groups had said the wildlife rules could hamper Shell’s drilling season. On Tuesday, an environmentalist blasted the company’s blueprint for the Arctic that the Interior Department conditionally approved in May, pending permits including Fish and Wildlife’s. “Shell’s whole drilling plan is premised on a plan that is unlawful from the start,” said Erik Grafe, a lawyer at Earthjustice in Anchorage. Shell can still drill with one rig at a time this summer, if it gets a few more permits, the Interior Department said.